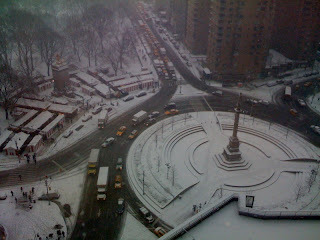 Christmas season in New York City is just as we had always imagined it would be - beautiful and festive. Henry David Thoreau said "live in each season as it passes; breathe the air, drink the drink, taste the fruit." We have been doing just that. This week was our first week of snow here. Last month my co-workers told me that it normally doesn't snow in NYC during Christmas time and so they were amazed when I got my Christmas wish of snow! 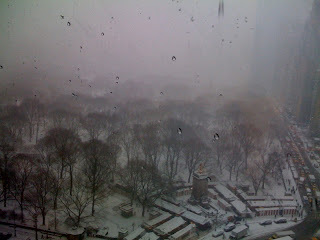 Central park covered in snow in the distance looks beautiful and spooky; like a forest scene in a fairy tale. The union square holiday shops tents. We definitely need snow boots to walk around. 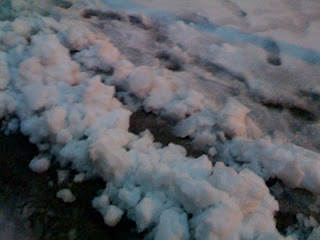 The streets are so slippery it's like ice skating on them. This year's Christmas tree at Rockefeller Center is a 72-foot Norway spruce from Hamilton Township, NJ. Mary Kremper, an immigrant from Hungary, and her husband planted the spruce in 1931 and she predicted her tree would someday make it to Rockefeller Center for Christmas. Although she's not alive to see her prediction come true, her twin 74-year-old sons proudly watched the 8-ton tree being cut down from their yard then loaded onto a semi-trailer from their home. What happens to these trees after Christmas? We'll need to go back to take night-time photos when the lights are more prominent. We still haven't had a chance to skate at Rockefeller Center. Now that it's Christmas season, it's horribly crowded. We tried and failed to go on Sunday night hoping to skate from 11 PM to midnight. We did, however, get to witness a marriage proposal on the ice - all the other ice skaters and onlookers were cheering and aaaaawing after she appeared to say "yes." It was a very romantic, innocent and beautiful moment during these cynical times. There must have been hundreds of marriage proposals that took place during the Christmas holidays at this ice rink; they even offer a package called Engagement on Ice. So we didn't get to go ice skating this weekend (and didn't get our Magnolia cupcake thanks to another monstrous line), but we finally did a horse carriage ride through Central Park. I think the first time I wanted to do this was as a little girl when I watched Six Weeks. It's something we wanted to do just one time while here. The best part of the ride oddly wasn't going through Central Park, it was the short ride on the streets of Midtown among the flood of Taxis. It was freezing cold and the amount of people trying to get their turn on a short 20-min horse carriage ride was insane. It looked like long lines but they weren't really lines; there was no organization whatsoever and people who were waiting for one hour probably got bypassed by the person who was only waiting for 10 minutes. People were hailing the horse carriages like they were hailing cabs, but this was funnier because people were flashing their $100 bills so the carriage guys would stop in front of them. After we waited in one long non-line, we went up a block and tried our luck in another long non-line. Luckily, I made eye contact with a nice carriage man who stopped in front of us (it also helped that there was only two of us). There were a lot of angry people. Our carriage guy told us that it's only crazy like this during Christmas time because after January, they're the ones begging people to take a ride. With all this said, I probably would never do this carriage ride ever again. This Bryant Park Holiday Shop caught our attention because from a distance these looked like suits of armor. Metal Park created these cool Star Wars art from recycled scrap metal, engine and motorcycle parts. We didn't know how much these cost but considering they're selling an 8-feet-tall, 800-pound Darth Metal on their website for $7,000, these are probably in that price range. Some of the parts were movable and some were more than decorative - they could be used as small storage containers and pen holders. Naturally, my friend Marie came to mind. We really liked this chained out Yoda-gone-Mad-Max. Buy, we wanted. Expensive, it was. They even had Short Circuit and the Predator. On their website, they sell the Terminator, Alien, Transformer, the classic robot, and a samurai warrior. We also wanted to go ice skating at Bryant Park's The Pond, the park's winter wonderland centerpiece. But it was massively crowded (its New York's only free admission seasonal ice skating rink, although you still have to pay to rent skates if you don't have your own). There's even a view of the Empire State Building in the distance. We really wanted to get on the ice but The Pond's line was ridiculous - probably about a two-hour (or more) wait in the biting cold. This photo only shows half of the line. Hopefully we'll get to go before The Pond closes for the season on January 25, 2009. How great would it be to have the ice rink to ourselves. If we dared to be mischievous souls and skated while the ice was being cleaned. Bryant Park even set up a temporary lounge/bar right next to the ice skating rink for the winter season. Celsius: A Canadian Lounge, housed in a temporary glass structure, overlooks The Pond and offers drinks, lunch, and dinner. The decor of the upstairs part of Celsius, which even has chandeliers, makes it look like a swanky night club. We probably should have taken the photo from the other side that shows the full-service bar and the second floor area (again, just weird because this is something that probably will get torn down by February). This is their outdoor terrace, with heating lamps dispersed throughout. And did we mention how freakin clean Bryant Park is? Even their public restroom is clean, which is far from the case in almost all park restrooms. There was an usher handling the flow of traffic in the women's room by using a velvet rope at the entrance, like she was a bouncer at a nightclub. The most impressive thing was their toilet seat covers - you don't have to mess around with those annoying thin toilet seat covers that don't do crap to absorb the wet splashies on the toilet seat. At this restroom you just push a button and the toilet seat covers itself with a new hard plastic seat cover. Very appreciative of inventions that improve sanitation. More importantly, just easily amused. This is the MUDTruck parked in the East Village. We love that the company was started by a husband and wife team to be an anti-establishment coffee shop. We love that they purposely park across one of the busiest and largest Starbucks in the Village. 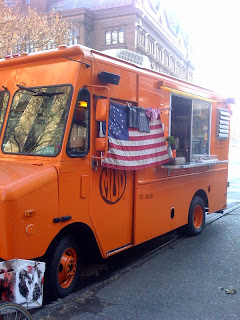 We love that the coffee is served from an orange converted Con Edison truck with the American flag on it. It looks like along with coffee, they should be serving apple pies, a six pack of beer, anti-war stickers, and Jack Kerouac books. Don't know why but the truck evokes those images. So we were excited to try the coffee, especially since we are not Starbucks fans. The coffee was voted the best in the city by almost everyone in this city. And it's affordable - $1.50 for a small cup. What's not to love? Well, then we tried the coffee. We were so disappointed because the coffee lived up to its name. It had a strong, bitter taste (same as its rival across the street). We're hoping we caught them on a bad day and we'll give them one more chance. The ironic thing is that for a anti-establishment company, they're getting pretty successful in the corporate world - we've spotted their coffee bags being sold for a hefty price at grocery stores and now apparently they're being sold at Kiehl's (the way Starbuck's is sold at Borders). I guess it's easy to forget that Starbuck's started out as a small company too. We're in recession, we know we need to save money, but it is so difficult when we're surrounded by restaurants on all sides. What's a food lover to do? Seek out places like La Bonbonniere. 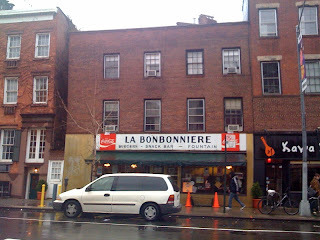 La Bonbonniere is a small, crowded diner in the West Village on 8th Ave that sells no-frills grease food and BREAKFAST FOOD all day at reasonable prices. The diner food lineup includes the usual suspects like banana and blueberry pancakes, omelets, Challah French toast, burgers, sandwiches, sausages, bacon and eggs. Despite the diner's out-of-character fancy name, La Bonbonniere is a casual diner. 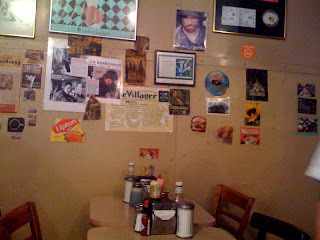 The diner itself looks a bit run down, which they attempt to enhance cosmetically with taped up photos of celebrities that eat there and articles about the restaurant. Apparently despite its worn down look and low-key setting, actors are often seen at this spot; Molly Shannon and Ethan Hawke are supposedly regulars. Every time we walked by this diner, at all hours of the day, it was always crowded, which made us think "these New Yorkers are on to something" and we finally tried it. We went around 2:00 pm and it was still crowded. Not one open table. The seats here are elbow-to-elbow. It's nice to know that we're not the only freaks in this city that eat at non-standard hours of the day. Despite the crowd, we received our food lightning fast. At last, our love, our breakfast food! 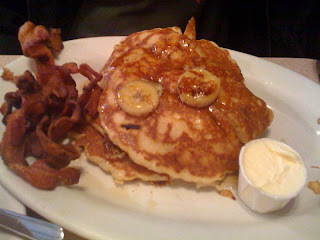 We were perfectly happy with their banana pancakes. And their bacon was crisp and not greasy. They did not skimp on the avocado. My avocado omelet came loaded with the healthy green fruit. 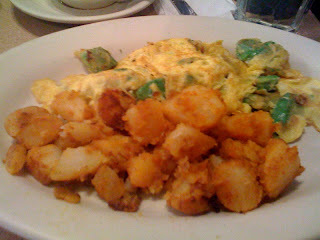 Actually, this might have been the first time where there was more avocado than eggs in my omelet. 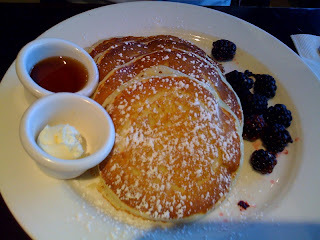 Whether folks are happy to be able to get breakfast for under $10 in the West Village neighborhood or they're hoping to share some maple syrup with a celeb, this place definitely has a following. We've just joined the ranks (for the food, of course; we have absolutely no interest in sitting next to a celeb, with the exception of Ms. Streep or Mr. Pacino, of course). 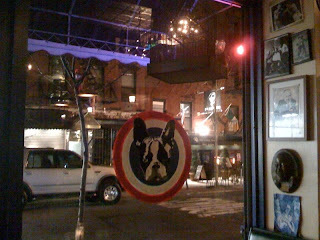 We discovered Zucco: Le French Diner on 188 Orchard Street while wandering around the Lower East Side. 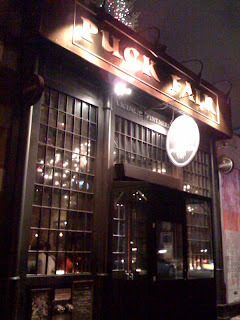 We haven't had French cuisine yet while in the city but we wanted to find a French restaurant that wasn't pretentious. We found THE perfect place. 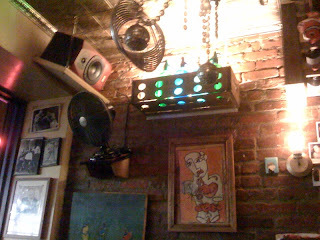 Le French Diner is a very tiny restaurant with good atmosphere, good music, good service, and good food. What it lacks in space it makes up for with its charm and character. Le French Diner looks like the kind of restaurant that Parisians that are anti-Champs-Elysees type of scene would dine at if it were in Paris. These photos stink but it was very dark in there. The owner of the restaurant is a French man that goes by just one name "Zucco" (like Prince or Cher). He's an older man that looks like he used to be a biker or a drummer for a rock band, but has a soft-spoken mannerism. 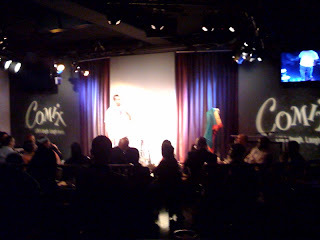 The only thing we heard him say all night was "merci." Zucco acted as our chef, our waiter, our host, and our busser. We saw only two other workers that were washing dishes and helping with some cooking. Everything at this restaurant is petite and dark, including the bathroom. The bathroom was only lit by Jesus candles and you feel like you either needed to say confession in there or you suddenly felt transported to that scene in the 1976 prom horror flick Carrie when her crazy mother locks her up in that tiny room. Their mini kitchen is right behind the bar that seats six or so people. There’s about four sets of two-seater tables and they are all really close to each other. This is not a place to have private conversations. With just a few tables and a no reservation policy, the best chance of getting a table is to arrive by 6:30 PM. 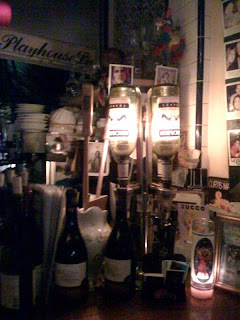 Their drink menu consists of French beer and wine. 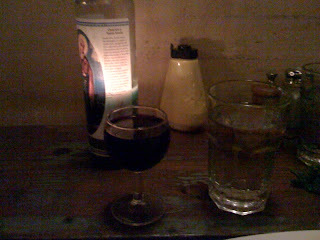 The wine is served in petite glasses from Paris (at $5 a glass). Their Bordeaux was excellent. Their menu is classic French with lots of cheese, butter, and bread, and ranges from the very simple (cheese and cold cut platters) to more elegant dishes. Some of his menu items include: homemade foie gras with apple compote and toast; smoked herring with warm potato salad; snails; lamb sausages; bacon and cheese pie; risotto with Arborio rice, truffle oil and cheese; tagliatelle with bacon, ham, cream sauce and poached egg; Le Croque Monsieur; and grilled filet mignon burger. 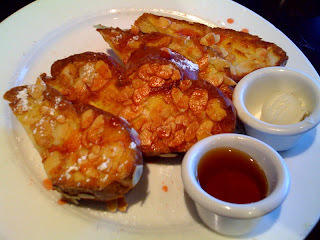 He also has a simple French brunch menu, desserts, and an array of espressos and cappucinos. 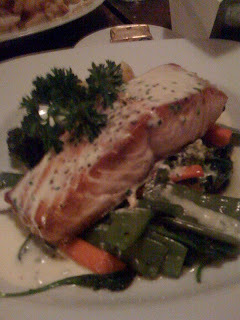 Zucco's Le Saumon Grille in creamy sorrel sauce served with mixed vegetables was very rich. Lots of butter and cream. The salmon was cooked perfectly. 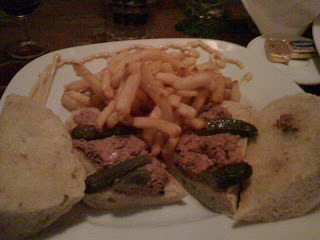 The Le Pate Beurre Cornichon (pate, butter cornichon on a soft baguette), served with French fries. There is no ketchup at this restaurant. I was a bit saddened by this at first. But Zucco squeezed a ton of spicy mustard on the edge of my plate that surprisingly went well with the fries. The only thing that could have made our experience here potentially disastrous was if we didn't have enough cash. We weren't told until we were handed our bill that the restaurant only accepts AMEX or cash. We can't wait to go back!